You know a myth we hear often, that really gets us riled up? It’s the myth that attachment parents can’t, or shouldn’t, sleep train. We’ve worked with many attachment parents over the years who’ve told us that initially, they were very, VERY hesitant to sleep coach because they felt that it would surely mean they had to compromise all their AP values and principles. Some of these parents struggled with chronic exhaustion and sleeplessness for years before finally reaching out to us for help. Well, we’re ready to set the record straight: attachment parents CAN sleep train in a way that is both effective and that prioritizes their parenting philosophy. Miriam Chickering, an experienced sleep consultant, can vouch for that as she has spent several years helping other families sleep coach in a way that aligns with their philosophies, and believes wholeheartedly in the value of sleep coaching — AND she practices attachment parenting principles in her own home, with her 6 kiddos! So she’s the perfect person to discuss this topic. Keep reading, and hear Miriam’s thoughts on how attachment parents can sleep coach effectively and gently, as well as her tips for helping attachment parents get more sleep, and build healthy sleep habits in their little ones. You may be thinking that attachment parenting and sleep coaching won’t mix, but they really can go together very well at The Baby Sleep Site®. How is that possible? Because we use a holistic approach to sleep – one that accounts for all elements of a child’s emotional, mental, and physical development. This holistic approach allows crying to be minimized, which is crucial to attachment parents who are embarking on sleep coaching. Often, making small changes in one or more of these areas goes a long way towards improving sleep, and it ensures that we aren’t overlooking anything when we begin working on sleep habits. It also means we have less work to do in sleep training, and that in turn means we will likely have more success using gentle methods with minimal crying. Once we’ve properly set the stage for sleep, we want to move on to resolving unwanted sleep associations. This is really the “sleep coaching” part of what we do – and this is what tends to scare attachment parents away, honestly. But here’s what I want to emphasize: there are very gentle ways to resolve unwanted sleep associations. I know that many attachment parents hear “sleep training” and immediately think crying baby, who screams for hours, but that absolutely does not have to happen…there are so many options between ‘sleepless nights’ and ‘screaming baby’! Now, speaking of resolving unwanted sleep associations – let’s first define ‘unwanted sleep associations’. An unwanted sleep association is something that your baby relies on to go to sleep that ALSO causes sleep problems throughout the night. If your baby is rocked to sleep and then sleeps for 5 hours, you probably do not have an unwanted sleep association; however if your baby is rocked to sleep and wakes the moment you stop providing the movement, that’s when you have an unwanted sleep association, since you’ll likely have to spend your nights rocking instead of sleeping! Similarly, if you’re co-sleeping, and your baby wakes periodically through the night needing to nurse, but then falls right back to sleep, this may not be a problem for you at all. But if your baby is waking every hour needing to nurse, and then wants to stay awake and hang out with you for awhile, that is almost certainly an unwanted sleep association! For some parents, a sleep association will become unwanted only when it causes 5 or more sleep interruptions, or when it keeps them awake virtually all night. For other parents, a sleep association becomes unwanted when it causes just 1 or 2 unnecessary sleep interruptions. Really, the line between ‘okay’ and ‘unwanted’ is personal, and varies from family to family. Once you’ve identified the sleep association that’s causing a problem – be it nursing or holding or rocking, or perhaps another association – we focus on gently fading out that sleep association and providing comfort in other ways, while also gradually helping your baby to learn to fall asleep without any help from you. It’s amazing how well this can work when all the groundwork has been laid in a very methodical and comprehensive way and then each step is broken down into easily attainable goals. Obviously, as attachment parents, we have the goal of limited crying and plenty of soothing and comfort for our babies during the sleep coaching process. But if you are currently sleep coaching, and want to continue to co-sleep while sleep coaching, you’ll need to follow a few unique tips to ensure you see progress. For starters, end your “hands-on” soothing about 5 minutes before you want your child to fall asleep. This ensures that you aren’t inadvertently putting your baby to sleep; remember, the goal of sleep coaching is that your child learns to fall asleep on his own. I also urge parents to choose a 4 to 5-hour sleep stretch that belongs to them. For some parents this will occur at the parent’s bedtime, after a final Fill-Up feed (if your baby is still young enough/needs to receive a fill-up feed before you go to bed). For others, it may be from midnight to 5 am. The important thing is not to feed your baby in this one time slot. Let your spouse or partner give comfort if your baby wakes, but do not offer a feeding. Within a few weeks of beginning this “sacred slot of sleep”, your baby will most likely stop waking during this time, and everyone will get at least one lengthy stretch of sleep at night. Remember that you may have to offer an extra feeding at another time of the day or night to make up for a missed feeding at this time, but you NEED your “Sacred Slot of Sleep”. It will help you become a better parent during the other 19 hours of the day! I wanted to end by sharing some really easy, basic tips that any parent can do to help promote better sleep and healthier sleep habits. Use these in conjunction with sleep coaching, or – if you’re not quite ready to sleep coach yet – use them on their own. 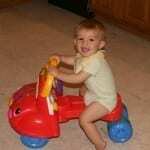 Start your day in the same 30 minute time window each day, even if you and baby had a rough night. Utilizing a fixed point like this keeps your schedule from getting too far off track. Many attachment parents use the ‘Pantley Pull-Off’ to gently transition their baby away from the breast. It works like this – you allow your baby to keep sucking at the breast until he’s drowsy, then you gently break the seal with your finger and pull your breast away. It works for many moms, but if the Pantley Pull-Off isn’t working, I recommend you stop using it and try a different method. Consider fading, or pick-up put down. If you are co-sleeping, at bedtime, stop a feeding at least 15 minutes before your child falls to sleep, and – as mentioned earlier – stop your hands-on soothing 5 minutes before your child is due to fall asleep. 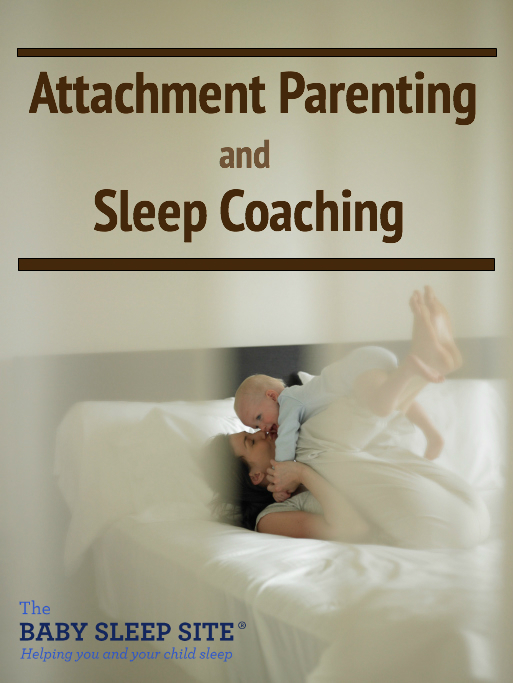 Still Not Sure If You Can Mix Attachment Parenting And Sleep Coaching? You don’t have to sacrifice your parenting philosophy in order to sleep train – there is a sleep training style to suit every parenting style! Our consultants at The Baby Sleep Site® specialize in creating Personalized Sleep Plans® that are customized to your own parenting philosophy, and that will NEVER make you feel guilty or pressured to give up your unique parenting style. Even better, once you have your Personalized Sleep Plan®, your consultant will walk you through each step of implementing it at home. Browse our list of consultation package options here.Once you make your choice and purchase, you will immediately receive an e-mail with your Helpdesk login information. You’ll be able to log in and start right away – it’s that simple! Essential Keys to Your Newborn’s Sleep is THE newborn sleep book that will help you to not only improve your newborn’s sleep using gentle, sleep-inducing routines – it will also answer your feeding and newborn care questions. You can even buy a bundle package that includes the e-book AND a Personalized Sleep Plan® PLUS a follow-up email to use for further support!